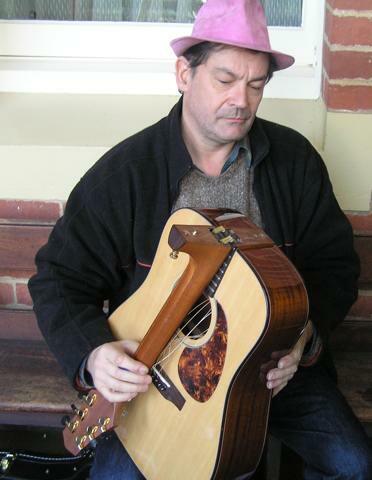 On my last day at this year’s Beechworth frestival I ran across Gerry Hale sitting out the front of the Old Priory playing guitar and displaying a range of fine acoustic instruments from his music shop – The Guitar Gallery . Of particular note was a guitar that was built and designed to travel. Not a guitar that is so cut down that is pretty much suitabe only for traveling, but a real full sized guitar – dreadnought body, full scale length neck and a big acoustic sound. Not believing what I saw I had to take some photos of the guitar to share with our readers. The guitar’s design simply allows it to separate in the middle, with the neck to folding over onto the guitar top and pack away in a case slightly larger than the guitar body. This instrument is an amazing feat of engineering and I guess to be expected at some point. When you’re ready to play it, unfold-tighten the bolt and with minimal retuning – it’s ready to play. Gerry has these instruments on sale at his ‘Guitar Gallery’ and is a great sponsor of bluegrass music events.